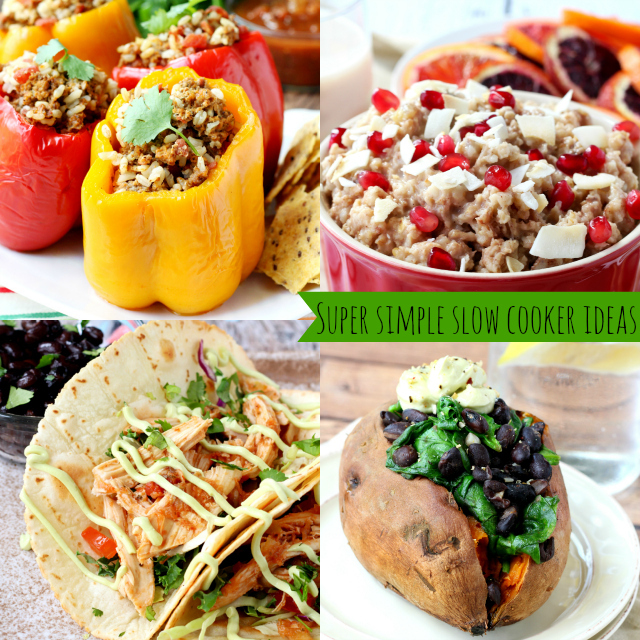 Today, I’m sharing my favorite, go-to, simple slow cooker meal ideas. Every single one of these recipes can be part of your meal prep and then used later in the week, throughout the week for different meals or served immediately after slow cooking. 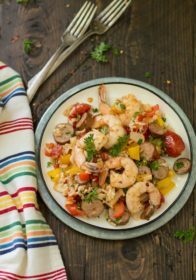 These super simple slow cooker meals are all included in my regular rotation and are enjoyed by the whole family. As a working mom, I know that planning a healthy dinner every day is enough to drive anyone crazy. This is why I love using my slow cooker, to cut down on extra time and work for me. I have this easy-to-use, inexpensive slow cooker from Kohl’s and it truly is a busy family’s best friend. If you’re in need of even more slow cooker meal ideas, be sure to follow my Slow Cooker Pinterest board. 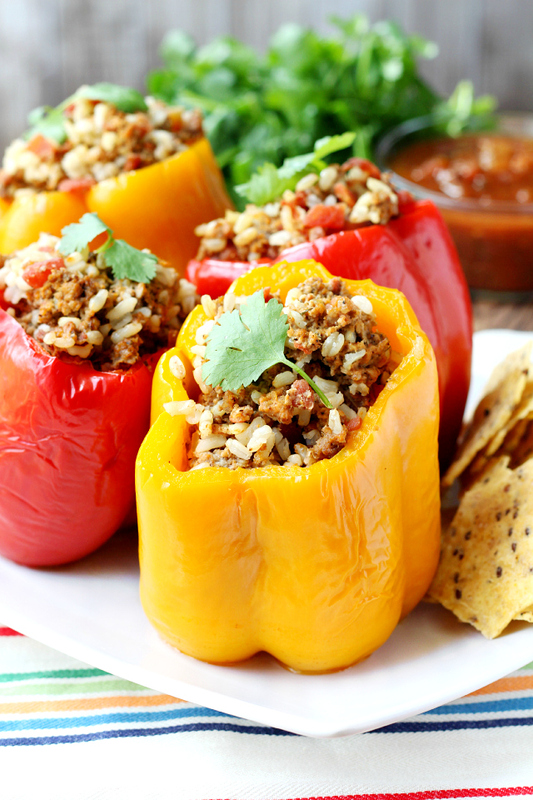 Nutrient-rich bell peppers are the perfect vessels for holding deliciously seasoned bison, brown rice and diced tomatoes for a complete satisfying meal. I enjoy baked stuffed bell peppers very much, but honestly my favorite way to eat them is straight out of the slow cooker. They’re so much juicer and it doesn’t hurt that they’re way easier! To save time- prep everything the night before (cook rice, mix all ingredients and store them in a covered bowl in the fridge). 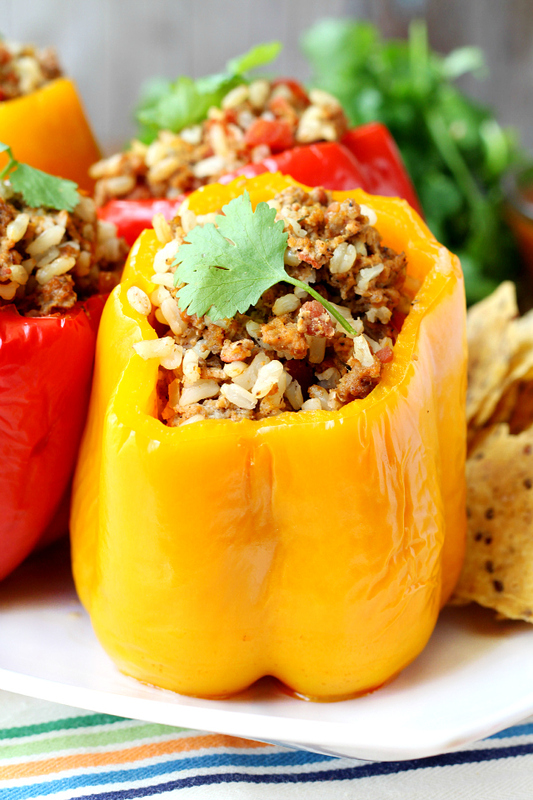 In the morning, stuff your bell peppers, set the slow cooker and go on about your day. Dinner will be waiting when you get home! I served my stuffed bell pepper with a spinach salad and chips and salsa. 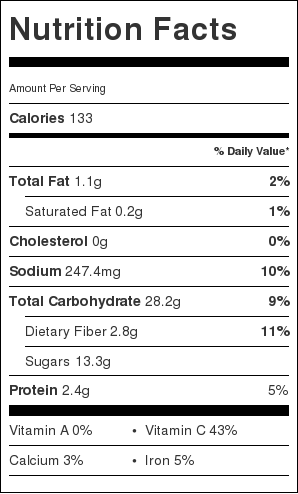 Nutritional information calculated for one stuffed bell pepper (using the following; bison, brown rice, diced tomatoes) without extra toppings. 5. Serve stuffed bell peppers with refried black beans, salad and/or chips and salsa. A slow cooker recipe for breakfast? You bet! 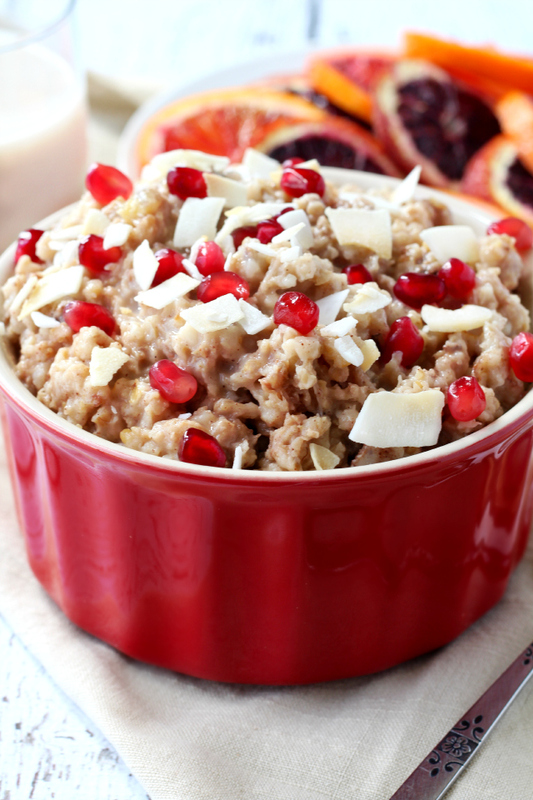 Set up your slow cooker with a blend of basic steel cut oatmeal ingredients and have a healthy delicious breakfast waiting for you in the morning. 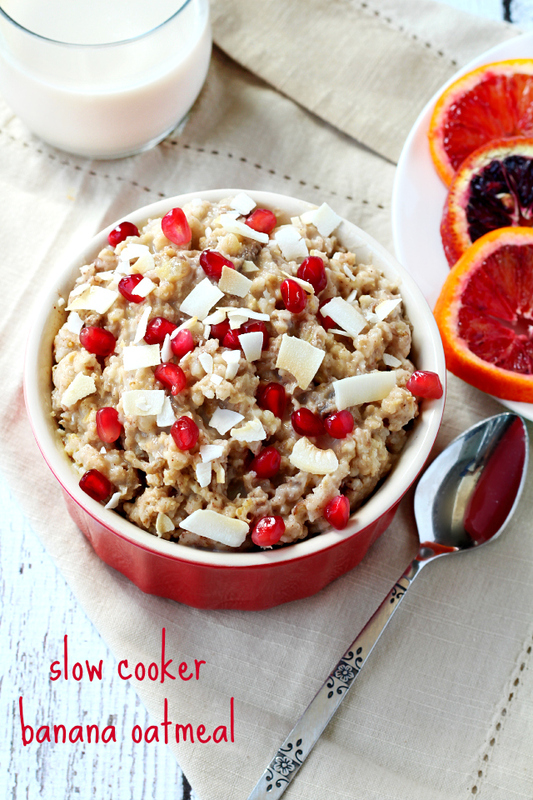 I kept this slow cooker banana oatmeal recipe really simple, without an overwhelming ingredient list. Your bowl of oats will be a blank slate, ready to be finished off with your favorite toppings. I enjoyed my oats with a splash of almond milk, a couple of stevia packets, coconut chips and pom seeds. Yum! Totally makes getting up out of bed, in the morning, worth it! Nutritional information calculated for 1 cup of cooked oatmeal without additional toppings. I usually eat about 1 ½ cups. 1. Spray slow cooker with a nonstick cooking spray, place all ingredients in slow cooker and stir until well combined. 2. Cook overnight on low for 8 hours. 3. In the morning, stir oatmeal with a fork to loosen the steel cut oats and make sure everything is fully incorporated. 4. 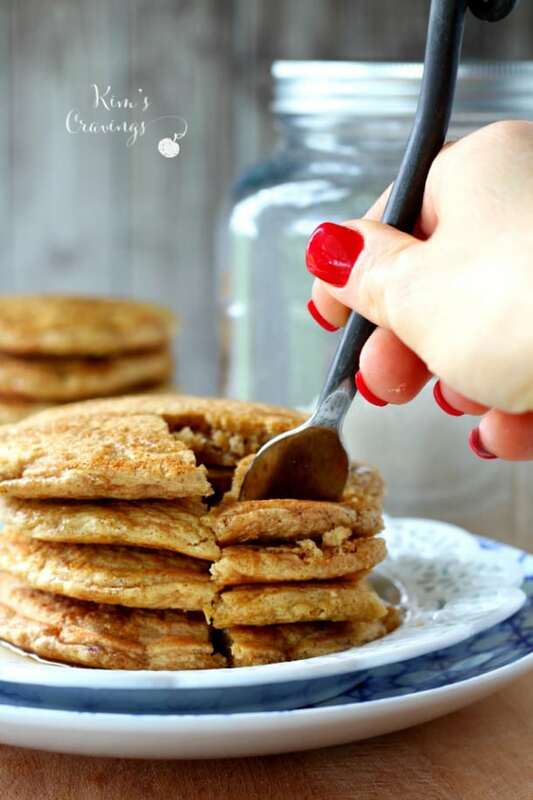 Serve warm with a splash of almond milk, fresh fruit, sweetener and nuts or nut butter. It simply does not get any easier than this, people! Have a favorite salsa? Got about a pound of chicken? Yes… well than you’ve got the perfect ingredients for taco filling, salad mix-in, pizza topping, soup add-in, burrito stuffing… and the list goes on…. I typically make this every weekend to have chicken ready for whatever I may be craving during the week. With this last batch of two ingredient chicken that I made, I used it to make chicken tacos. 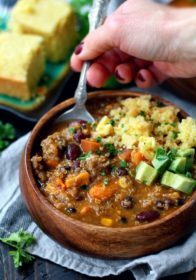 Just add your favorite taco toppings and serve with black beans, brown rice, chips and salsa… an easy, peasy lunch or dinner! 1. Place whole chicken breasts, which have been seasoned with a bit of salt and pepper, in your slow cooker and cover with salsa. Toss chicken with salsa until well coated. 2. Cover and cook on high for 4 hours, or low for 6-8 hours. Remove each chicken breast out of the slow cooker and onto a cutting board or plate to shred with a fork. 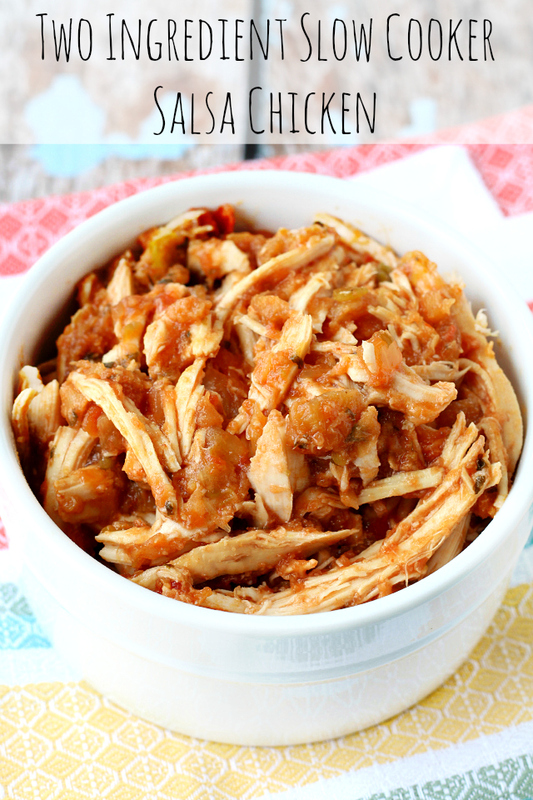 Add shredded chicken back to the slow cooker and toss with remaining salsa and juices. Serve immediately in your desired recipe, or refrigerate in an airtight container for up to 5 days. 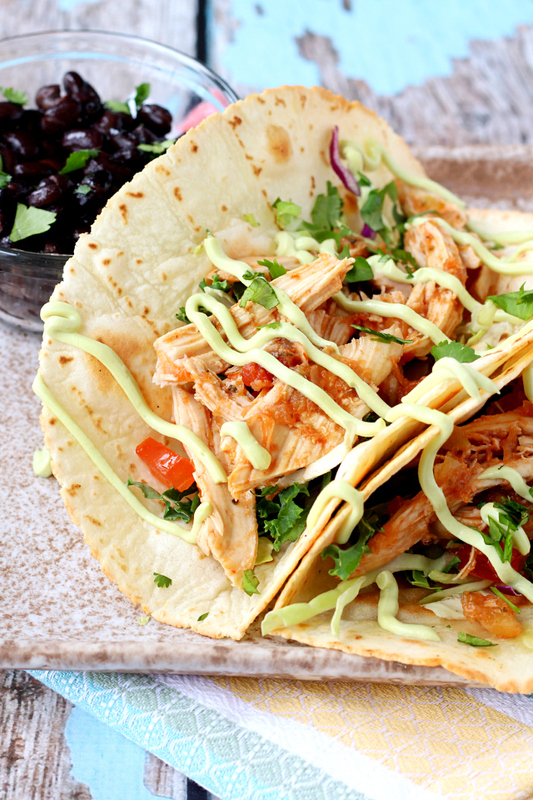 Depending on how you’re going to use the chicken, I would recommend draining it from juices before filling tacos or using it as a topping for pizza or salad. You can also freeze the chicken, in an airtight container or freezer safe baggie, for later use. I first got the idea for this two ingredient salsa chicken from Teri at A Foodie Stays Fit and have since also seen it on Gimme Some Oven. 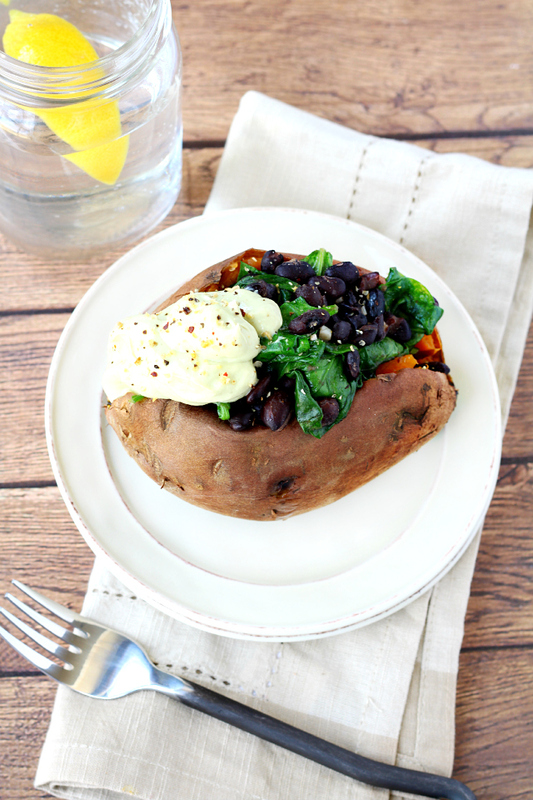 This very easy recipe… if that’s what you want to call it, works with either regular white potatoes or sweet potatoes. 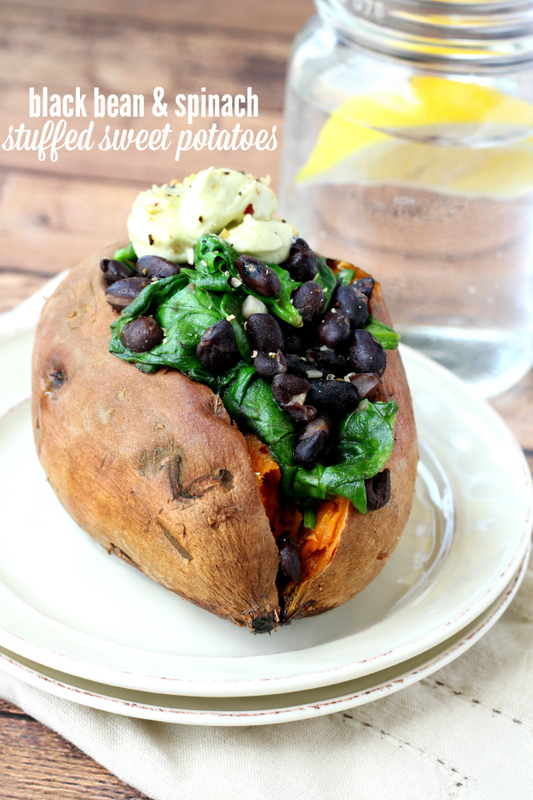 I so prefer sweet potatoes- they’re way healthier and in my opinion, way tastier! 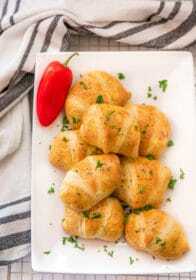 I like making a slow cooker full of these to use as a side or even snack throughout the week. You can also use these potatoes as an actual meal by stuffing them full of tasty ingredients. Try sweet potatoes Southwestern-style by stuffing the potatoes with salsa, guacamole, black beans and corn. 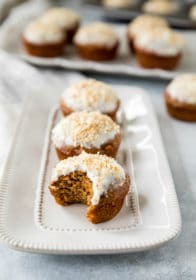 Another must try is the breakfast sweet potato topped with Greek yogurt, granola and almond butter! A great stuffing idea that I came across in the February 2015 edition of Woman’s Day magazine was a simple stuffing of spinach, black beans and Greek yogurt. 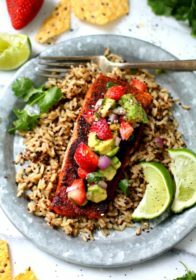 It makes for a light, but satisfying lunch or pair it with seared salmon or grilled chicken for a wonderful dinner. Wash sweet potatoes, but don’t dry. Put on the bottom of the crock pot, put lid on, and turn on. Cook on high for about 4 hours or low for 7-8 hours or until tender. Serve with a little salt or any other favorite toppings. Although I have not tried it, I know people have had success cooking white and red potatoes with sweet potatoes. I recommend cooking potatoes, together, that are close to the same size, smaller potatoes will cook much quicker than larger ones. Super large potatoes may take longer than the recommended cooking time. Nutritional information calculation does not include Greek yogurt or Avocado Crema. 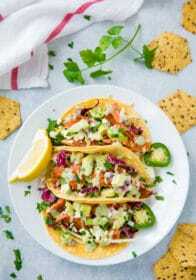 For Avocado Crema- Blend the following in a blender; 1 large avocado, 2 teaspoons lemon juice, ½ cup nonfat Greek yogurt, 1 teaspoon hot sauce (Tabasco), 2 tablespoons olive oil, 2 tablespoons water, ¾ teaspoons garlic salt and additional salt to taste. 1. Heat oil and garlic in a large skillet over medium heat. Add beans, cumin, cayenne and 2 tablespoons water, increase heat to medium-high and cook, tossing, until beans are heated through, about 2 minutes. 2. Add the spinach, season with salt and cook, tossing until beginning to wilt, 1 to 2 minutes; remove from heat. 3. Split the potatoes and season with salt and pepper. Top each potato with bean mixture and serve with a dollop of Greek yogurt or, better yet, Avocado Crema. 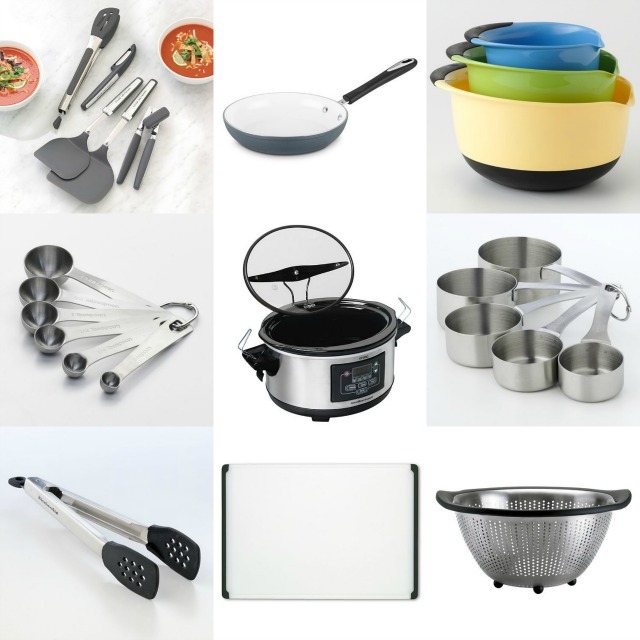 Kitchen utensils that I use while preparing these meals are; large skillet, mixing bowls, kitchen tools, measuring cups, measuring spoons, tongs, colander, cutting board… and the slow cooker, of course! What are your favorite quick and easy slow cooker meals? Have you ever tried cooking oatmeal or potatoes in the slow cooker? Pinterest: http://www.pinterest.com/kohls/ Love the #MakeYourMove board! 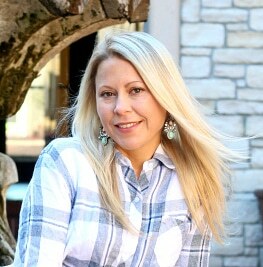 I feel like you made this post for me – I’ve been looking for new crock pot recipes!! thanks! Haha… glad I could be of assistance! Enjoy! Hope you had a chance to try out the recipe and it came out delicious! 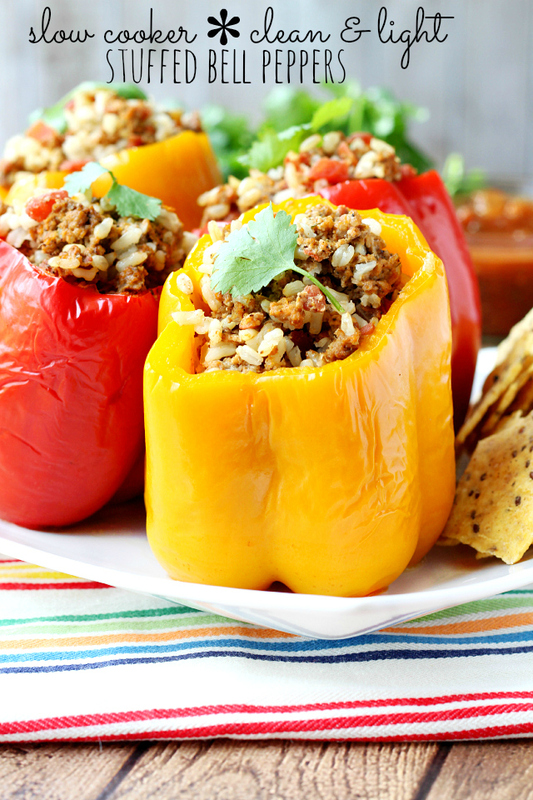 This may be a dumb question, but for the stuffed bell pepper, do you cook the meat prior to stuffing it, or does it cook in the slow cooker? It works great with raw meat, but if you prefer, you can also brown it ahead of time. Enjoy!